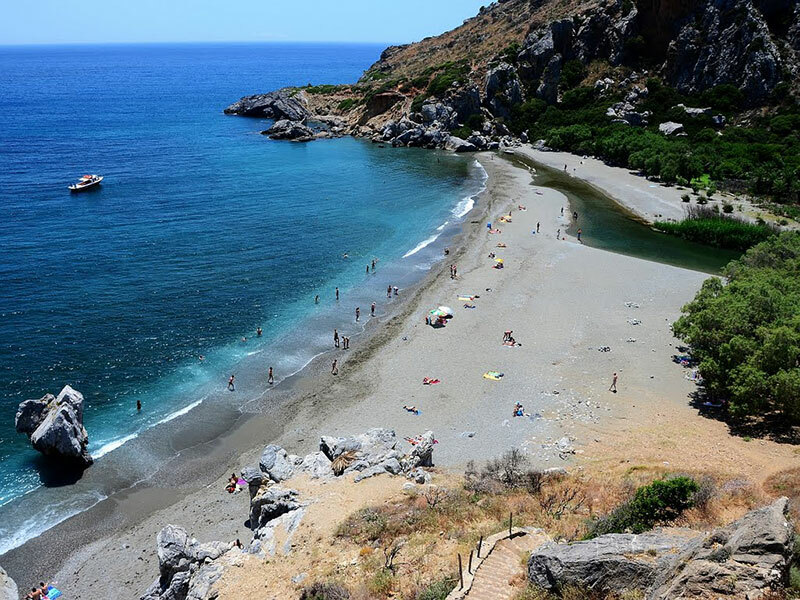 Following our previous article related to Kedrodasos Beach, Preveli Beach in Crete is located about 35km south of Rethymnon and 10km east of Plakias. 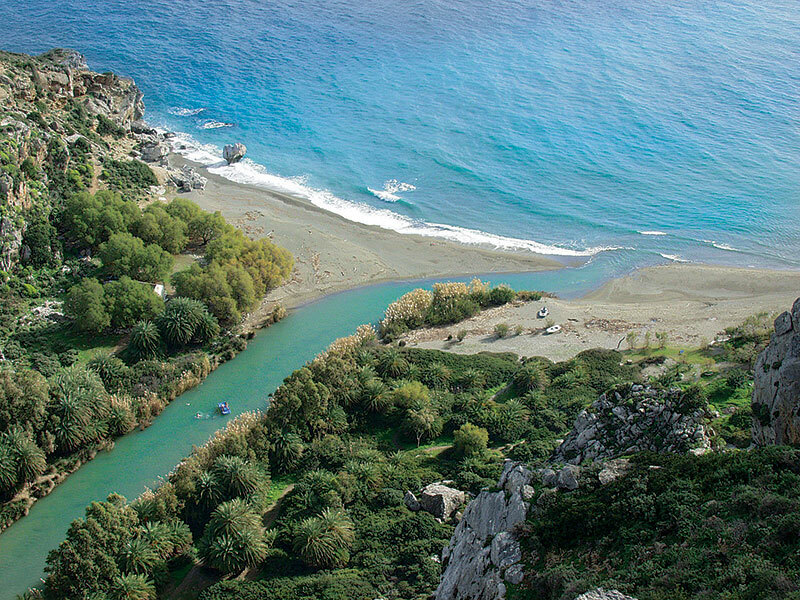 Preveli Beach, also known as Limni of Preveli (Preveli Lake) or Finikas (Phoenix), is located at the exit of the imposing Kourtaliotiko gorge, crossed bu the Great River. 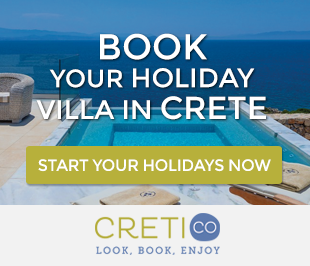 It is certainly the most famous beach of southern Crete, and receives thousands of visitors every summer. On the banks of the Grand River is a large colony of palm trees of Theophrastus, which gives the area a sense of African landscape. The river forms a large lake 1.5km long before it flows into the sea and has water all year round. 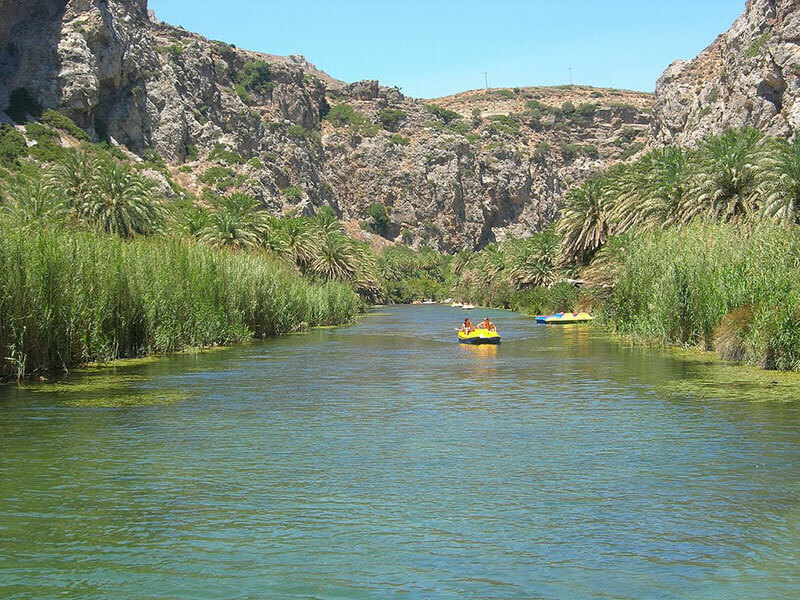 You can walk along the river, under the shade of palm trees and other trees, and begin to ascend the beautiful gorge. The swimming in the river will certainly be a pleasant experience. The palm forest was completely burned on 8/22/2010 due to a big fire, but paradoxically returned greatly in a short time. At the exit of the river is formed a sandy beach with pebble bottom and very cool waters. 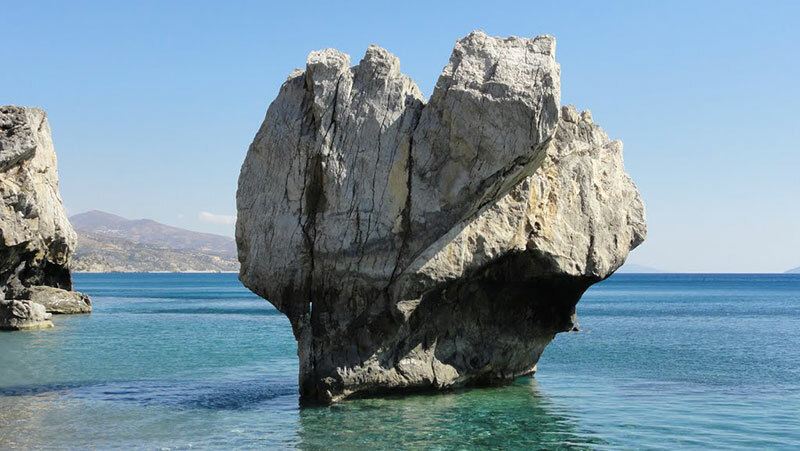 In the eastern part of the beach there is a beautiful imposing rock, looking like a ship’s mast. Fortunately this small paradise is not very organized. You can be served to eat and drink, as there are few restaurants and snack bars nearby. However, there is no possibility to stay overnight. In recent years there were several umbrellas and sunbeds for bathers. But as the image destroyed the exotic appearance of the beach, they were withdrawn. So the image of African oasis remained unscathed. It is also worth to rent a pedal boat for a ride on the river. Because of the image that gives the unusual environment, the beach is very popular destination for tourists even from the 1970s. Then came and camped here many hippies who made huts with grass and branches of palm trees. This continued until the late 1980s. You have two basic options to access in the area, either from west or east. The first is to drive from Plakias to Preveli Monastery, following the signs. 1.5km after the Kato Monastiri (Lower Monastery) of Preveli, you will stop in a large parking lot, where begins a path that goes down to the beach. The parking lot is located above towering vertical cliffs, west of the beach. There you can take some fantastic photos. To get off the beach path, you have to walk about 15-20 minutes. To avoid difficult climbing, you can also drive the dirt road leading to the nearby village Drymiskiano Amoudi. Then you can walk the short path leading to Preveli in just 5 minutes. However, you will not have the chance to see the breathtaking views from the high cliffs of the west side. Also, there are boats from Agia Galini and Plakias operating for Preveli. 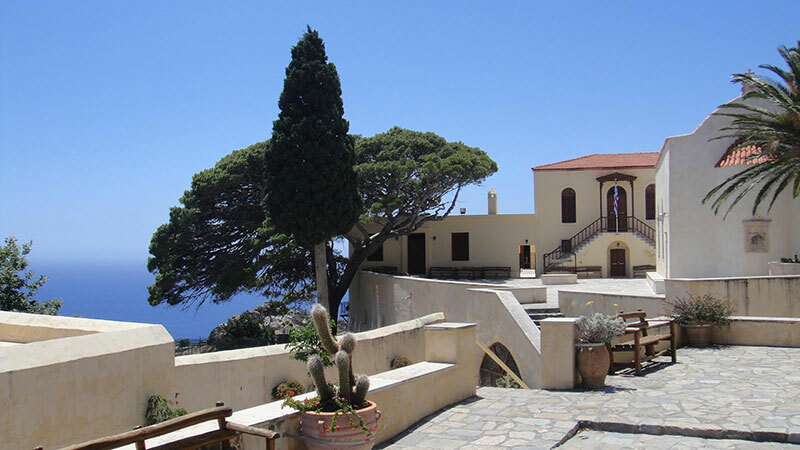 The new monastery of Preveli, Piso Moni, is the most important monastery of the region. It has twenty cells, hostel, library and museum. In the museum are displayed vestments, sacred vessels and important religious relics. The monastery played an important role in the struggle against the Turks. 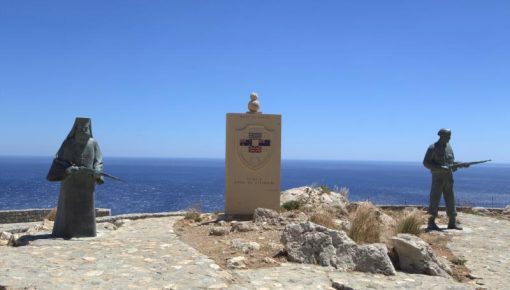 During the German occupation offered shelter to many Greek fighters and foreign soldiers who took part in the Battle of Crete. The view from the monastery is unique as it is at a very great height and overlooks the endless Libyan. 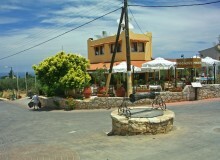 You can find beautiful villas near Preveli or generally in the area of South Rethymnon. Preveli is one of the best beaches in Crete. 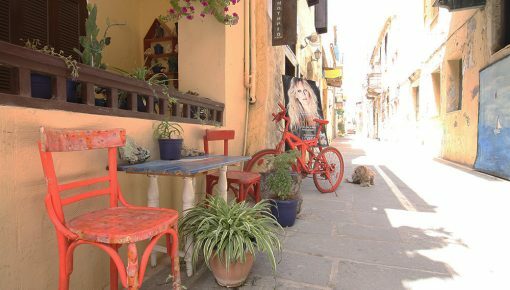 Posted on 21 Apr 2015 in Rethymno and tagged Beaches In Rethymno, Best Beaches In Crete, Monastery of Preveli, One Day Trips In Crete, Plakias, Preveli, Preveli Beach.